We toured Petrified Forest National Park in early April by motorhome. Our first stop was the Painted Desert Visitor Center. There are several buildings here with a gift shop, restaurant and a bookstore/ranger station. I went in to the ranger station to get a map and to get my two Bark Rangers registered. 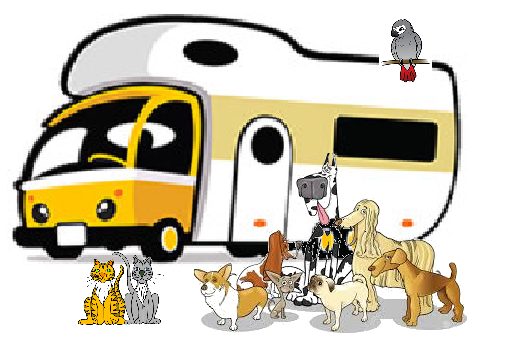 Although while at the visitor center, I left my dogs in the motorhome, there were others who tied their dogs up just outside in a small courtyard while touring the gift shop and restaurant. This National Park allows dogs on the trails and throughout except for inside the buildings. You can pick up a Bark Ranger passport and get it signed by a park ranger to make your Bark Rangers “official.” Basically, you are agreeing that you will make sure your canine companions are good citizens as you tour the park and that you follow the rules. There are lots of walking opportunities for you and your Bark Rangers. Most of the walking paths are just short loops of 1/2 to 1 1/2 miles. There are some longer trails as well if you are the adventurous type. I would recommend going in spring or fall when the weather is more cooperative for dogs. After leaving the restaurant and gift shop we started our driving tour. There were 8 stops that had enough parking for motorhomes and we stopped at 5 of these. The dogs had a great time and there were other travelers with dogs as well. I did have to deter the little poodle mix from trying to pee on the ancient petrified logs — quite the temptation for a male dog. I just didn’t think it was appropriate although it probably wouldn’t have hurt anything. Please be sure to keep your dogs on the path, don’t pick up any rock “souvenirs” and scoop the poop as you enjoy this really fabulous National Park.